I live in terrace b.c can you tell me what this is? So what you are saying is Marten? I'd say mink. Ears are small and appear almost hairless, compared to a marten's ears which look almost like a fox's ears. 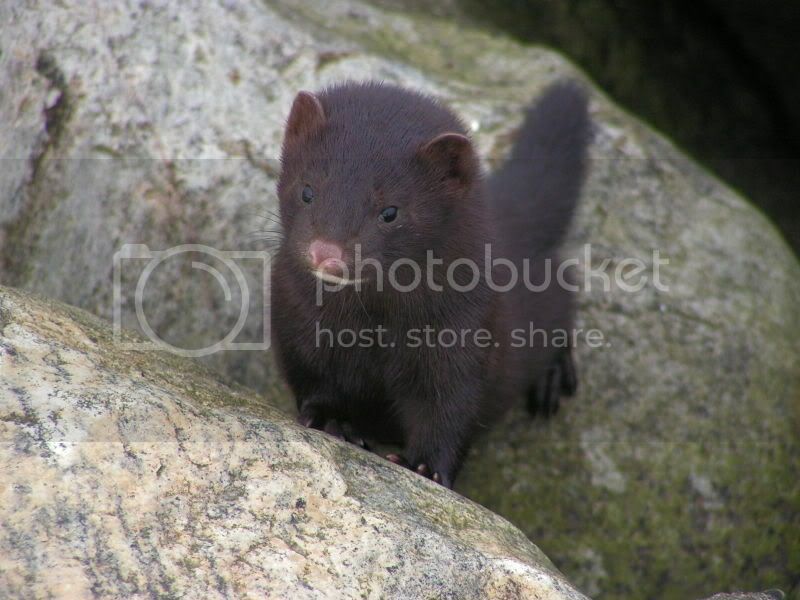 Plus the coloration of the face and body is more typical of a mink than a martin. Nope his pic is a Fisher. A minks fur is shiny and a fisher dull. One lives in water the other in forests. I'd be surprised if mink were indigenous to Northern BC. No amphibians or reptiles to eat (mink eat a lot of water snakes) the rivers are icy cold with mainly anadromous fish populations. Saw this cute "little" guy today up in Silver Lake Wilderness Area. Yes but to a porcupine its worst nightmare. Imagine meeting your end by being bit repeatably in the face for half an hour. Amazing how fast and sure footed it was on that trunk. Not many options for the squirrel. I thought it was particularly entertaining footage. Both those animals make the forces of gravity appear optional.